The clock has struck 11:59 on the Mystics season. One minute, one loss away from being eliminated from the WNBA Finals which would put an end to this awesome run that the Washington Mystics have put on during this WNBA season. However, they will be at home and they will have come off a much better performance from Game 2 even though they lost. Mystics fans will hope that the home crowd will be enough to lift Washington to victory over this next week to stay in the WNBA Finals. 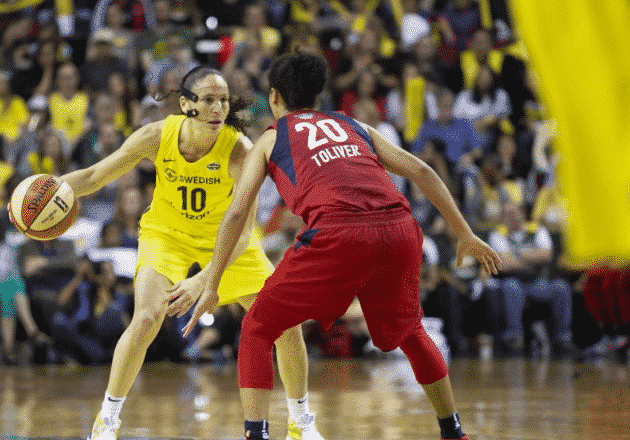 However, when Sue Bird used her signature move by pulling the good old swipe-around-the-back, it showed the beginning of the end in Game 2 of the WNBA Finals. It set off Mystics guard Kristi Toliver and coach Mike Thibualt but Sue Bird didn’t see it as much of a problem. Even though it looked blatant at the time, Sue was playing smart and she knew exactly what was going to happen. The Storm had a foul to give and the referees just missed it which is very unlucky for the Washington Mystics as it could’ve been a whole different story if they caught that. Kristi Toliver certainly stated what her opinion was postgame. Well, that was Toliver’s version. And remember, her father, George, is a longtime referee who is currently associate vice president of referee development in the NBA. So that “basketball IQ” comment might not go over so well with him. However when Sue Bird was asked about it, she clearly stated her aim was not to foul. Even though the Mystics had failed to make a three-pointer all game and only trailed by one, Sue was worried about what Kristi can do at the 3-point line as well as she can attack the basket with ease. Even if you are not a fan of the ‘good ol’ Sue Bird move,’ you’ve gotta credit her for making a play that not many players would’ve been able to do. Moving onto the Mystics who looked better than they did in game 1 but still didn’t do enough to get a win. While they had plenty of runs and looked a lot better swinging the ball around, it still wasn’t enough as the Storm would eventually get to the heart of the Mystics lineup and make it really tough for them to score anything. Elena Delle Donne had 10 second quarter points but not much after that. Ariel Atkins failed to build on a successful game 1 outing. The bench was only able to score 16 points when we all know they have and very well could’ve done a lot better than they did. What really killed the Mystics today was their 0-16 shooting from beyond the arc. We know the Mystics have many shooters on this team but today showed that the defense of the Seattle Storm is for real. They also need to do a whole lot better on the glass as shown by the Storm getting five more offensive rebounds than the Washington Mystics and in general, the Mystics got outrebounded 36-26 in total. They are going to need to be able to create their own shot and show a lot more effort on the glass if they are going to win game 3 of the WNBA Finals in front of the DC faithful. Overall, the Mystics should be confident going into game 3 of the WNBA Finals. Most teams wouldn’t be as they’re on the brink of elimination but it’s different for Washington. They went toe-to-toe with the Storm and if they get any sort of outside shooting on Wednesday, we could see them live to fight another day. All the Mystics can do at this point is brush off any negativity they have going forward and just prepare for the next game like it’s the first game of the season. Like there’s no record. Like they want to have an undefeated season and that’s hard to do but with their backs against the wall, it’s the only way to look at it. The Mystics are in the WNBA Finals until the end of the ride. They’re not done yet. I’m really nervous about Game 3 tomorrow night between the Mystics and the Storm especially since it’s going to be a “Win Or Go Home” type of scenario. However if Delle Donne has 100% recovered by then it’s going to be a very long night for both Stewart and Seattle because Delle Donne will be fired up and coming out and playing like the best player in the world which coincedentally she actually is.